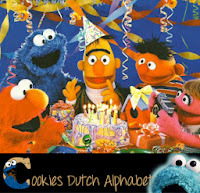 F is also for feest (party). Me love to party. There are snacks, cake and cookies at a party. And yummy drinks. And lots of music. You can have all kinds of parties. Like costume parties, barbecue parties and – of course – a birthday party. To make celebration complete you need feestversiering (party decorations). 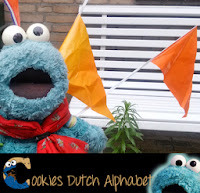 Right now the Dutch are celebrating the great FIFA World Cup 2014 results with orange party decorations. It looks so cool outside! 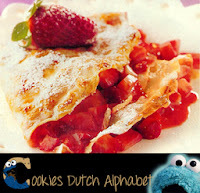 Last but not least me is concluding the letter F with some yummy Dutch words. 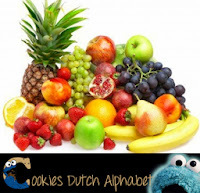 Like fruit, that starts with a F in Dutch and English and means the same thing: fruit! Next to cookies fruit is one of my fave snacks! You can combine fruit very well with flensjes (thin pancakes, also known as crepes), like strawberry and cream… me mouth is watering already! 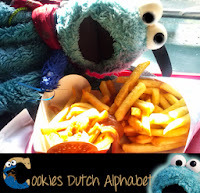 Me also love friet (fries) with mayonnaise or applesauce… And maybe a frikandel. There is no English translation for it, it is that typical Dutch. It is a special kind of sausage and it is eaten with curry ketchup or ketchup with mayonnaise and diced onions. But you can also eat is with peanutsauce or just mayonnaise. It is a really popular snack. Well that was the letter F! Me hope you are enjoying my Alphabet. If you do feel free to leave a comment or share it on your Twitter or Facebook. If you do, please Tag me in it (@Cookie_Report on Twitter and cookiereport on Facebook). Me loves that. Well bye bye for now! Me will see Sir Tom Jones tomorrow. Be ready for another blog soon!